Location: Welcome to ‘Arran’. This splendid property located approximately 4km from Wexford Town, adjacent to Ferrycarrig, in this most accessible and sought after location. A 5 minute’ drive will take to all Wexford town amenities, including excellent primary and secondary school, restaurants, supermarkets, sporting amenities etc. Kitestown, Crossabeg is a much sought after location, with easy access to the M11 Motorway. This location is approximately 1½ hours’ drive south of Dublin and 20 minutes’ drive from the International Ferry Port at Rosslare. General Description: Built in the 1830’s, ‘Arran’ is a truly superb family home tucked away in this tranquil setting at Kitestown, Crossabeg. It an exceptionally private residence, set on circa 15 acres. The property comprises an absolutely charming period residence of superb proportions and with many unique features, together with an interesting arrange of outbuildings. It stands on circa 15 acres, comprised in formal and informal gardens, woodland and paddocks. The entire property is presented in excellent condition throughout, meticulously maintained both internally and externally. 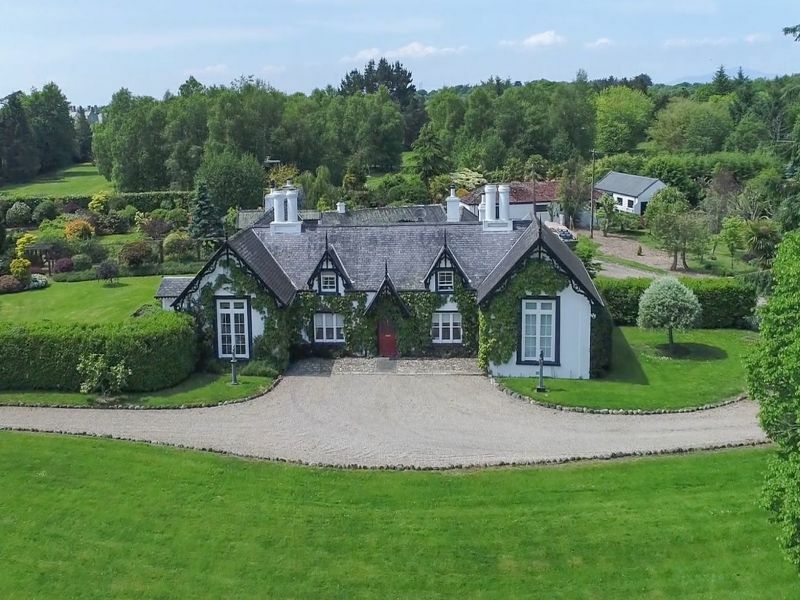 It is one of the most attractive period properties in County Wexford. Arran has been occupied by the current owners for some 35 years and it has been lovingly maintained to the highest standard. This late Georgian residence was built in 1836 and its façade is be-decked with creeper. The accommodation, apart from the master bedroom suite, which is at first floor level, is singe storey offering accommodation of gracious proportions. There are high ceilings, large windows that create bright rooms and magnificent fireplaces, including an Adams fireplace in the drawing room. The grounds are a particular feature – the house is approached by two sweeping driveways through mature trees with paddock to the front and stone wall along a minor road. The gardens are landscaped with numerous trees, ornamental shrubs and mature hedging. There is a rear courtyard and upper yard with an excellent range of well-maintained out-offices. Reception Hallway 6.16m x 3.81m With feature archway leading to stairway. Bathroom 4.45m x 2.61m With w.c., bath and shower connection. Separate w.c. shelved store adjacent. T.V. Room 4.12m x 3.09m With mahogany fireplace. Drawing Room 6.28m x 4.36m Feature Adams fireplace, two display alcoves and ornate ceiling plaster work. Small Garden Room 3.30m x 2.56m Overlooking the patio and gardens. Rear Hallway 12.11m x 1.52m (max) Pantry adjacent. Kitchen/Breakfast Room 7.35m x 4.48m With full height pitched beamed and timber panelled ceiling. Door to patio, featured oil fired Aga cooker, built-in seating and tiled floor. Extensive range of built-in floor and eye level presses, stainless steel sink unit, built-in AEG electric oven and warming tray, integrated dishwasher. Island unit with built-in in 4-ring gas hob and Miele built-in barbeque griddle. Bathroom 2.48m x 2.44m W.C., w.h.b., bath with rainwater shower overhead. Bedroom 1 4.92m x 5.02m (max) With w.h.b. and recessed lighting. Bedroom 2 5.00m x 4.05m With extensive range of built-in wardrobes, recessed lighting and cornice. Bedroom 3 6.18m x 3.35m With recessed ceiling lighting and built-in wardrobe. Bathroom En-Suite 4.15m x 3.82m W.C., bidet ‘his & hers’ w.h.b., corner Jacuzzi bath. Approximate Floor Area: c. 306 sq. / 3,294 sq.ft.